As the second coming of the Lord approaches, news of the world’s end propagates. Throughout the church age, most see Daniel and Revelation as two major prophetic books in the Bible. For this reason, many have attempted to lift the veil on these books to find mysteries concerning the so-called Last Day of the Lord. As a result, one after another has fallen into the pit of date setting for the second coming of Christ. Rather than as prophetic books, Daniel and Revelation should be better received and used as two key handbooks for a full course of Christian growth from the new birth to maturity. Granted these two books do contain prophetic mysteries concerning the end times, but we can only comprehend those mysteries from these two angles: (a) God’s eternal plan and (b) a matured Christian life to live out this plan. Only then we can say that we have collected all diamonds in the rough from these two books. 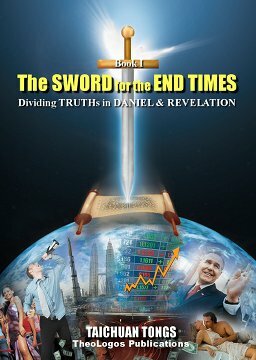 Because of the mercy and special arrangement of the Lord, today, we can publish this little book The Sword for the End Times (I): Dividing Truths in Daniel and Revelation written by Taichuan Tongs. This book is presented in a format similar to Streams in the Desert. The daily message is short and independent, giving readers more room for reflection, yet the assembly of all the daily pieces presents a full picture of one big puzzle. The goal is to maintain the triunity of the Bible—integrity, invariance, and inerrancy of the Old and New Testaments in their original languages. In general, we call the first six tools “biblical language study tools” in this book. In fact, the answers to questions such as at what hour Jesus will come and what day is the end of the world are not that important anymore. These are the important questions: What must happen before and at the end? Where are you going to end up after the Lord comes back? Are you going to be with God, or are you going to be cast into the lake of fire? PS: This book, in Chinese, was originally distributed free among Christians, starting from May 2011. This English version is a direct translation of the Chinese book in order for more people to have a chance to read it.